been sold - an average of one original painting per showing. b. The average price of each painting sold is $8,000. c. The average age of each original buyer is 28 - 33 years old. So come and join Frederico at his next Open Studio for a weekend of fun, great wine and food and of course, a showcase of over 200 works of art! Please bring your friends! "Red Poppies II" was painted by Frederico on September 12, 2001, a day after the 9/11 tragedy. Frederico was outraged and depressed over the situation and to release his feelings, he painted the day after the incident. By using bold red and orange colors, Frederico expressed his feelings of anger towards the terrorists. The cooler colors of blue, green and purple on the painting symbolize his sympathy towards the victims and their families. "Red Poppies II" is one of the most beautiful still life paintings that Frederico has created and will be exhibited at his upcoming Open Studio. This 40" x 30" Van Gogh inspired original, currently valued at $10,000, is available on giclees, prints and gift items at www.domondon.com. The Frederico Domondon Collection of unique gift items and notecards is currently available for purchase on www.domondon.com or at his next Open Studio. If you are looking for unique and elegant gifts at affordable prices, Frederico's ceramic trivets, ceramic coasters, clocks and notecards will suit your needs. 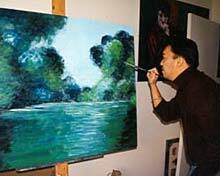 What makes them most special is they all feature Frederico's best paintings. His ceramic trivets and coasters are all handmade and are waterproof and heatproof. In addition to his current line, Frederico now offers X'mas cards and jewelry tile boxes. Gift wrap and a free note are available with purchase. Frederico can also come to your home or office to present his gift items - by appointment only, please call in advance. Frederico will be exhibiting his paintings during the winter season at two elegant 4-star Bay Area restaurants: Papillon, a French restaurant in Fremont, and Toscana, an Italian restaurant in Marin. 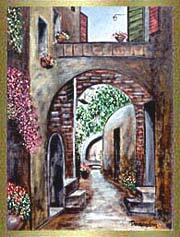 "Villa In Gubbio", Frederico's 2002 masterpiece, has been chosen to appear on the cover of the Walnut Creek & Alamo Telephone Directory from January to December 2003, with a circulation of 100,000. This painting is destined to become one of Frederico's most popular paintings of all time. Frederico will also be exhibiting at private home showings in the Bay Area. Robert & Jennifer Kuropkat of Alameda are hosting a private showing for Frederico's paintings on Nov. 23, Saturday night. Details will be announced later. If anyone is interested in sponsoring Frederico to exhibit in their private homes in upcoming months, please contact him at 415-640-1657.